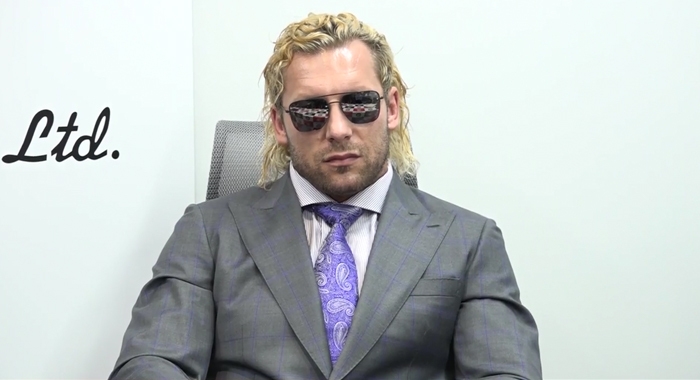 Kenny Omega ended months of speculation when he finally announced his signing with All Elite Wrestling. Omega was the industry’s hottest free agent and many believed he would join WWE at some point. But when AEW became a reality, all signs began to point to Kenny rejoining his Elite teammates. Omega’s announcement came during the February 7th Double or Nothing rally in Las Vegas, after a night of one surprise signing after another. It was a feel good moment for fans that have indeed been anticipating Omega’s decision. But Kenny’s time on the podium was cut short thanks to Chris Jericho, who interrupted him and stood eye to eye with him on the stage. The two former rivals came to blows and had to be separated by AEW officials, who pushed Jericho back through the crowd. Kenny ended his promo by putting on Jericho’s trademark black fedora, then delivering his closing line of Goodbye and Goodnight, Bang!